You have 4 seconds to engage someone that’s walking by, and distractions are everywhere – what do you do to grab their attention first? Before reserving a booth at an industry tradeshow, ask yourself and your team, “What are we trying to accomplish by going to this tradeshow?” Tradeshows can be rewarding and can demonstrate true ROI if you do it right and are clear about what you want out of it. Attempting to attract an audience to your booth can prove to be challenging and we all know tradeshows can be extremely expensive, so set tangible objectives, that can measured as outcomes. Without objectives, how else will you know if the tradeshow was successful? 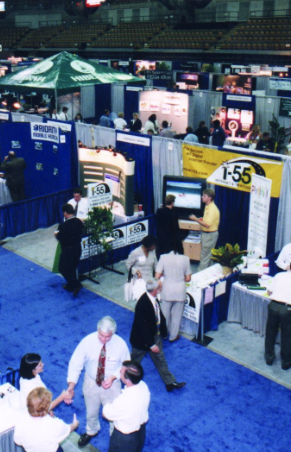 Whether your desired outcome is to generate buzz, increase brand awareness, build customer relationships, share industry knowledge, network, or gain leads, relying on random traffic in the room is not the wisest strategy (especially when most tradeshow attendees already have an idea of which booths they plan to visit before they get to the show). If you don’t set out measureable objectives, you wont have a clear understanding of how your booth performed. Contact your regular customers, local contacts and existing prospects, and, if you can get access to the list of registered show attendees, contact them too! Make appointments by reaching out through direct mail, email, or the phone. Most exhibitor staff sit behind tables. Don’t do that! Get up, and engage with people – that’s what you’re there for. Either push the table against a wall or leave chairs out of your booth set up. Tradeshows are an investment of money and time. If you’re making the investment, try to grab a good location (the better locations will be more expensive), and brand your booth. Your actual booth itself is a silent salesperson – it speaks for you and your brand when you’re not able to, so it pays to have a pretty booth in a great location. TV screens, or interactive touch screens are a great way to grab attention and share your key messages! Something else to consider is having a benefit-oriented sign that can be seen from down an aisle on the showroom floor. It should have verbiage that gives prospective clients a reason to stop and showcases a solution to a customer problem. Your signage should also answer the question all potential customers will be asking themselves – “What’s in it for me?” Don’t be afraid to be specific – it will weed out anyone who isn’t your target. Tradeshows are an “in-person” event, but social media should still play a part. Let your clients and prospective clients know where your booth is and what you’re up to over social media. Being active on social media during the show will help you connect with attendees and those who couldn’t make it to the event. It’s common for events to have their own Twitter hashtag, so participants can communicate with one another from the showroom floor. Every year tradeshows drive thousands of people to different events. Exhibitors can pay for passes to give to great customers, prospective customers, or media, to join you. The show organizers will be promoting the event themselves (which in turn promotes you by association), so give back to your partner by promoting them. You need to respond to leads really quickly! Key in business cards right at the show, and follow up either later that day, or early the next morning. If a lead calls you first, do NOT wait – call them back immediately! Do you create a strategy for your tradeshows? Do you have the same strategy every year? How do you measure the success of your tradeshows? Do you have any tips you would like to share? Please feel free to leave questions or comments in the comment section – I’d love to hear your stories!